Arts for LA applauds Governor Edmund G. Brown for signing into action the 2015-2016 state budget, which includes a whopping $7.1 million permanent funding increase for the California Arts Council (CAC). The CAC, a state agency, awards grants to nonprofit arts organizations across the state. Today, Governor Edmund G. Brown Jr. signed a state budget that includes a one-time $5 million increase in general fund support for the California Arts Council. This is the first time in over ten years the arts have seen an increase of general fund monies, after support for the Arts Council was cut by 94% in 2003. The California State Legislature on Sunday approved a budget for 2014-2015 that includes a $5 million increase in funding to the California Arts Council. The California Arts Council and Californians for the Arts are celebrating positive steps forward for an appropriation bill of $7 million. Last Thursday, the California State Legislative Budget Conference Committee voted 8-0 to support the increase in funding for the state's arts agency. President’s Committee on the Arts and the Humanities (PCAH) co-chairs George Stevens Jr. and Margo Lion today announced the expansion of PCAH’s successful Turnaround Arts initiative – a program designed to help turn around low-performing schools, narrow the achievement gap, and increase student engagement through the arts. The program is expanding to 6 additional states this year including ten California schools. ACTION ALERT: Take Action for Increased California Arts Council Funding! Please take a moment today to voice your support for a substantial increase to California's investment in the arts. Arts for LA supports Californians for the Arts (CFTA) and California Arts Advocates (CAA) in their sponsorship two pieces of legislation, SB 1432 and AB 1662, that would increase funding for the California Arts Council. In response to decades of budget cuts to one of California's most dynamic industries, Sen. Ted Lieu today announced plans to restore state funding for the California Arts Council to levels not seen in more than a decade. Californians will once again have the opportunity to support the California Arts Council and its arts programs for children through their state individual tax refund. Yesterday, Governor Edmund G. Brown Jr. signed Senate Bill 571 (Senator Carol Liu, La Canada Flintridge), returning the arts to the voluntary contribution portion of California tax return forms through the new "Keep Arts in Schools Fund." 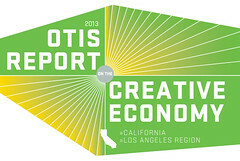 On February 6, Otis College of Art and Design will release the newest edition of its Report on the Creative Economy. At a public meeting in Los Angeles last week, members of the California Arts Council voted in support of five new programs and initiatives to be funded by one-time support from the California State Assembly.